Meet Sophia, Owen and Marshall: Three high school students who have raised $60k+ for education. Sophia, Owen, and Marshall exemplify what campaigning for PoP is all about. It all started in 2015 when the trio of friends was in seventh grade. They had always valued their own education, so when they learned about PoP’s mission they immediately jumped on board to help children around the world gain access to quality education. They’re initial goal in 2015 was $25,000, but through lemonade stands, local sporting events, and other community activities, they’ve raised over $60,000 thus far and have set a new goal of raising $100,000! Sophia, Owen, and Marshall are an inspiration to us all — a reminder that with passion and hard work we can truly all make a huge difference. The trio recently joined us on a trip to Guatemala to experience their impact first hand, and we can’t wait to see what they do next! We chatted with the trio about their progress so far, and what inspires them to keep going. What inspired you to become involved with Pencils of Promise? We were initially inspired to fundraise with PoP when we learned about the lack of quality education throughout the world. We have been so privileged to go to great schools and receive such high levels of education, but we have realized that everyone doesn’t get to go to schools like ours. This really inspired us to want to change that and make a difference. We first found out about PoP through one of our fathers. He heard about PoP on a Semester at Sea retreat where Adam Braun spoke. Once he heard that we wanted to get involved in this area, he told us about PoP. After some research, we really resonated with PoP’s mission and goals, so we wanted to get involved with the organization. What’s been your favorite part about campaigning? Our favorite part about campaigning has been running our two corn hole tournament fundraisers. We enjoyed seeing our friends and family while still working for our campaign. Also, it was rewarding to see our hard work pay off. Throughout the whole campaigning process, we’ve also loved connecting with our donors. We’ve loved talking to them about our work and seeing their reactions when they hears what we’re doing and how much we’ve accomplished. We’ve loved putting the FUN in fundraising. What are you hoping to do with PoP in the future? In high school, our goal is to continue to fundraise but also to take on a more leadership-like role in the organization. We are really excited to help the PoP Cub team as advisors to club leaders around the country. What is your favorite school-related memory? Every morning at our grade school, the entire student body would gather together for a morning assembly. It consisted of announcements, interesting facts, and performances. It was uplifting to see everyone come together and unite over a common bond — being students. We loved connecting with all peers, friends, and teachers. The music would really wake us up! To us, education is the foundation for a happy and fulfilling future. Our education helps us to thrive in the world. It gives us the tools we need to succeed in life. Outside of campaigning for PoP, what are your passions and interests? The three of us have many passions such as spending time with friends and family, playing sports, singing, art, biking, cooking, and traveling. We are also passionate about school involvement. 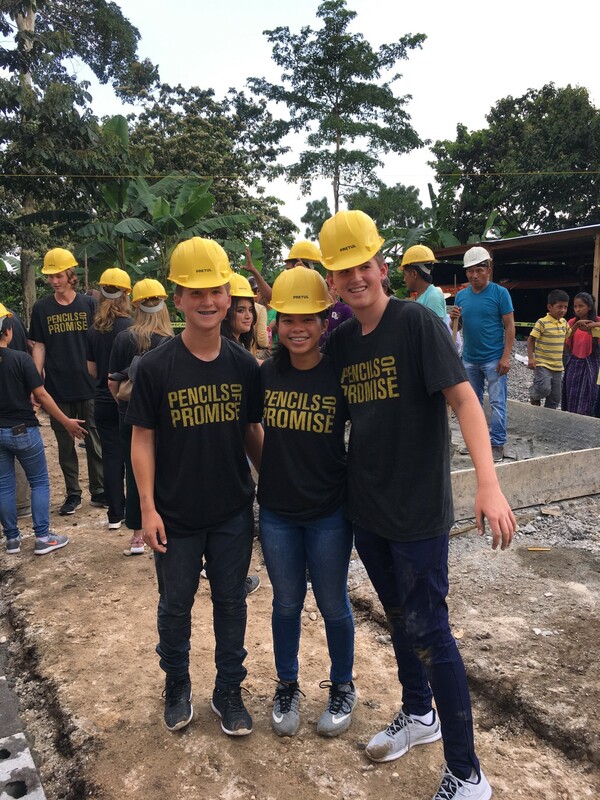 Recognizing the transformative impact of education, Sophia, Owen and Marshall continue to set ambitious fundraising goals to support Pencils of Promise’s WASH (Water, Sanitation, and Hygiene) and Teacher Support programs. We consider ourselves lucky to have incredible supporters like Sophia, Owen and Marshall, who are working for the greater good of the world. Even at a young age, the three friends are finding creative ways to engage their community. If you’re as moved as we are by this story, check out their fundraising page here and continue supporting their efforts to provide students across the globe with access to quality education.